Reports are submitted on a customised form via an intuitive and secure (multi lingual) web page. Once captured, each report is assigned to an accountable manager and distributed in accordance with the organisation’s existing workflow. 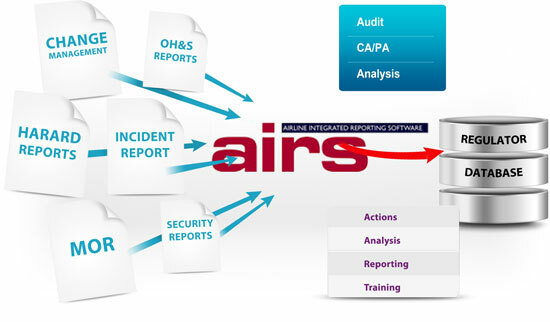 Remedial actions are assigned and tracked using AIRS integrated management tools. AIRS fully configurable taxonomy allows data to be stored in well-defined caches providing enhanced trend monitoring and subsequent analysis. Each occurrence report includes sub sections in which risk and causal factor information can be saved and subsequently analysed. AIRS had been designed to expedite the flow of information and resolve non critical events in minimum time. More critical events can be investigated thoroughly and the information saved in accordance with the ICAO annex13.